Nelsons and pianist Daniil Trifonov is a brilliant performance of Mozart. Courtesy photo by Hilary Scott. 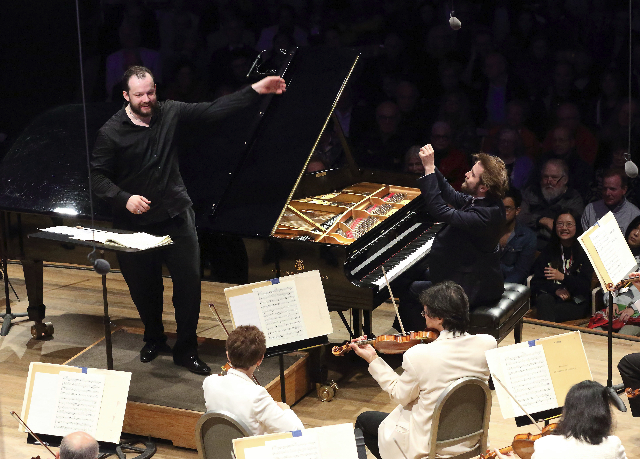 There was no heavy lifting for the Friday, July 14, Tanglewood concert conducted by Andris Nelsons. The program started with always delightful Ravel “Le Tombeau de Couperin” followed by Haydn’s Symphony No. 83 in G minor, “La Poule” (The Hen). Following intermission the theme of tombeau, French for tombstone works commemorating a notable person, continued with a piece by the contemporary composer, Thomas Ades. Featuring guest artist, Daniil Trifonov, the highlight of the program was Mozart’s Piano Concerto No. 21 in C, K. 467. Easing into the weekend there was a lightness to the Friday night concert from a drizzle that reduced attendance on the lawn as well as seating in the Shed. It is well established that commuters to the Berkshires arrive on Friday evening and focus on Saturday and Sunday concerts. Perhaps Nelsons was providing some breathing room for himself and the orchestra. It will be performed, all two and a half hours, without intermission. Indeed, what could be more ambitious or Wagnerian? Considering that marathon of endurance for musicians as well as the audience we were quite delighted with the more accommodating program last night. There was much to savor and enjoy in an evening of unabashedly beautiful and seductive music. This was particularly true of the Ravel which was truly enthralling. Nelson’s extracted every nuance of the soft, exotic, impressionist music. Originally composed for piano, eliminating two movements and shifting others he created an orchestra piece in four movements. Of which, the third, Menuet, proved to be particularly intoxicating. The tombeau of Ades “Three Studies from Couperin” for chamber orchestra (2006) was relatively brief and atmospheric with a sparing accent of percussion. Making his Tanglewood debut the Russian pianist Daniil Trifonov gave a galvanic, dazzling performance. He owned the work which was first performed by the composer. A slightly framed, seemingly delicate young man one remarked at the strength and vigor of attack when called upon. Of course the audience was stirred and delighted by the familiar F major slow movement. It became standard for its use as a score to the 1967 Swedish film Elvira Madigan by director Bo Widerberg. There was wild applause and calls for an encore, obliged, by the pianist and conductor. It conveyed that at the conclusion of a pleasant but even tempered performance the audience was given a moment to celebrate and remember. It is anticipated that moving forward audiences will look take note of future appearances of this brilliant young pianist. In 2011 he won both the Tchaikovsky and Rubinstein competitions. His stunning performance will long be remembered.